The present volume contains two curious documents concerning Dr. Dee, the eminent philosopher of Mortlake, now for the first time published from the original manuscripts. I. His Private Diary, written in a very small illegible hand on the margins of old Almanacs, discovered a few years ago by Mr. W. H. Black, in the library of the Ashmolean Museum at Oxford. II. A Catalogue of his Library of Manuscripts, made by himself before his house was plundered by the populace, and now preserved in the library of Trinity College, Cambridge. 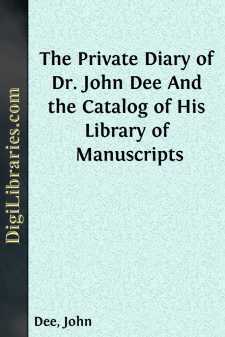 The Catalogue of Dee’s Library of Manuscripts, although long since dispersed, is valuable for the notices which it preserves of several middle-age treatises not now extant. He is said to have expended on this collection the sum of three thousand pounds, a very large sum in those days for a person of limited income. 1554. Aug. 25th, Barthilmew Hikman born at Shugborowh in Warwikshyre toward evening. My conjecture, uppon his own reporte of circumstances. Oct. 25th, D. Daniel Vander Meulen Antwerpiæ, mane hora quarta. 1555. April 22nd, Jane Fromonds borne at Cheyham at none. Aug. 1st, Ed. Kelly natus hora quarta a meridie ut annotatum reliquit pater ejus. Oct. 12th, the Lord Willughby born hora septima mane, ante meridiem, Lat. 51° 30', at Wesell in Gelderland.